Luminescent emission in the form of phosphorescence commonly occurs in daily life as a result of a quantum mechanically small transition probability. A luminescent emission lifetime can last from microseconds to several hours. 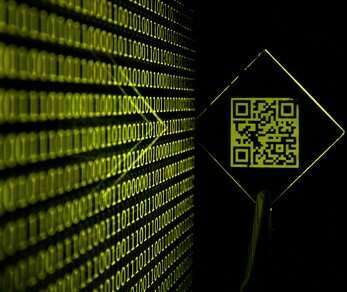 Popularly known for its use in glow-in-the-dark products and as emergency sign illuminants in public buildings, it is also a practical method for information storage, including stamp detection and verification. While easy and cost-effective fabrication methods presently exist to engineer phosphorescence systems using organic emitters, achieving visible organic phosphorescence under ambient conditions in lab for industrial translation is challenging. In a recent study, now published in Science Advances, Max Gmelch and colleagues at the Dresden University of Technology report a new milestone in organic luminescent labeling. 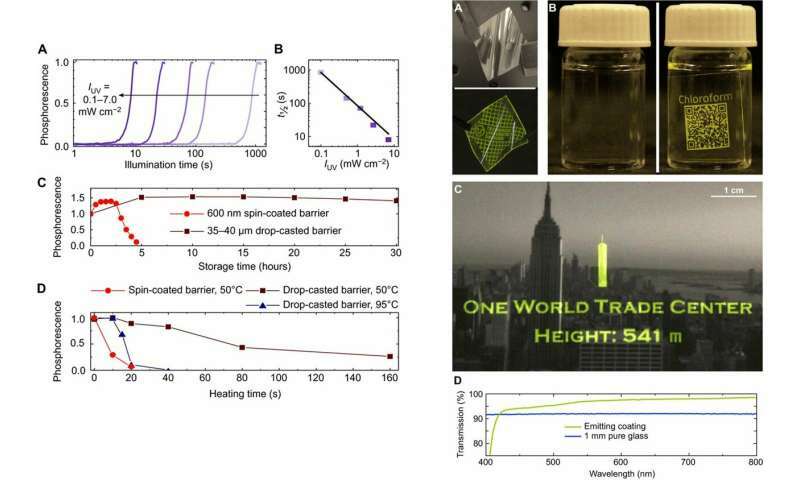 For this, they used a simple device structure made from commonly available materials to generate ultrathin, flexible and transparent luminescent coatings. The resulting labeling device was fast, with ability to print more than 40 cycles of information onto any substrate of any size, at high resolution. The scientists used light alone, without any ink, to print a luminescent message onto the material. The contactless process could also erase the image from the same material. The concept represents a promising method to produce luminescent on-demand tags to store information and supersede conventional labeling techniques. In the study, Gmelch et al. used an ultrathin emitting material layer with a thickness of 900 nm, predominantly containing poly(methyl methacrylate) (PMMA) also known as acrylic glass. They included a guest molecule known as NPB (N,N'-di(1-napthyl)N,N'-diphenyl-(1,1'-biphenyl)-4,4'-diamine), a commonly available hole transport material (charge extraction and transportation) used in organic light emitting diode (OLED) technology. The scientists engineered the thin translucent coating for luminescent labeling by combining the two materials (PMMA:NPB). Depending on the substrate of interest, the coating can also be used on a variety of different surfaces via spin coating, spray coating or dip coating. The scientists observed long-lasting, room-temperature phosphorescence due to moderate spin orbit coupling and dense packing of the PMMA polymers in the absence of oxygen. Analogously, to prevent the exposure of the phosphorescence emitting layer to oxygen, Gmelch et al. deposited a 600 nm thick oxygen-barrier-layer on top of the sample. However, since the scientists fabricated the samples under ambient conditions, the emitting layer contained molecular oxygen. 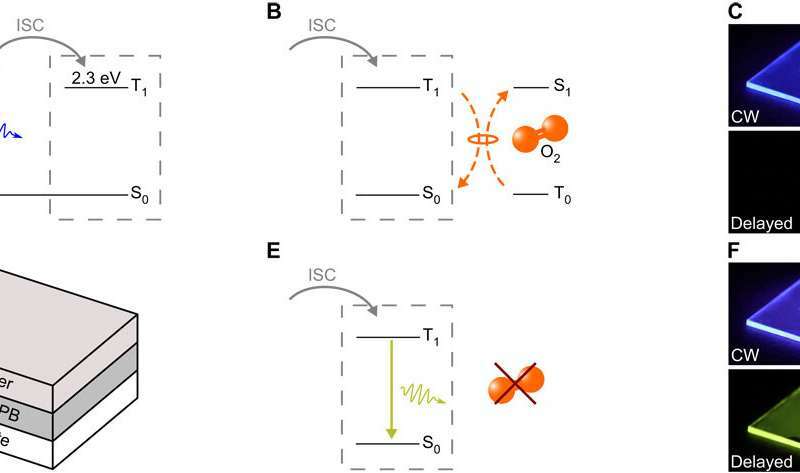 After excitation with UV light (365 nm wavelength), the NPB molecules reached their excited singlet state (S1), from which they either decayed back to the ground state to emit fluorescence, or populated the excited triple state T1 through intersystem crossing (a radiationless process of transition between two electronic states with different spin). The observed experimental energy levels fit well with values in the literature. A promising approach for light-based labeling involves the local removal of molecular oxygen using UV irradiation. However, this technique has only been reported in solution thus far. In the present work, Gmelch et al. implemented the technique on the fabricated thin solid film. In this case, the scientists experimentally excited the NPB emitter to the triplet state (T1) from which they were quenched by interacting with the triplet ground state of molecular oxygen (T0). By design, the resulting excited singlet oxygen density decreased by interacting with the local environment of the emitter, i.e. via PMMA material oxidation at the spots of illumination, giving rise to phosphorescence. The emission was immediately visible for a long lifetime of τ = 406 ms, after switching off the UV illumination. The process described by Gmelch et al. thus activated luminescence for the first time by removing oxygen from inside a thin film. They used the technology of UV light-dependent oxygen consumption as a writing tool to create an image on a substrate/material. Left: Dynamics of emerging and disappearing phosphorescence. (A) Normalized phosphorescent intensity of freshly prepared samples as a function of illumination time for different UV intensities ranging from 0.1 to 7.0 mW cm−2. (B) Illumination intensity dependences of required time to reach 50% of total phosphorescent emission. (C) Normalized phosphorescence as a function of storage time for two different film thicknesses, 600 nm (light red circles) and 35 to 40 μm (dark red squares), stored and measured under ambient conditions. The emission increase at the beginning is reproducible and under further investigation. (D) Normalized phosphorescence as a function of heating time. Right: Coatings on different substrates. (A) Flexible luminescent tag realized by spin-coating the emitting layer in between two barrier films in ambient light and showing written phosphorescence. (B) Flexible adhesive tag applied to a cylindrical glass bottle and containing information about the content, readable by eye and any quick response (QR) detector, and fully invisible when not read out. (C) Conventional monochrome photograph of the NYC skyline coated by drop-casting the emitting layer in between two barrier layers showing a programmable luminescent caption. (D) Transmission of an emitting layer similar to the one on top of the photo in (C) compared to 1-mm pure glass. Credit: Science Advances, doi: 10.1126/sciadv.aau7310. The phosphorescent images could be erased as fast and easily by applying infrared (IR) light of a wavelength of 4 µm for approximately one minute. In this instance, the radiation was absorbed by the PMMA, and the temperature increased approximately to about 90 degrees C to 100 degrees C, which was low enough to maintain thermal stability of all materials used in the study. Solidity of the material layers was well conserved during the whole process of erasing, while further write and erase cycles were subsequently allowed. Gmelch et al. observed the decreasing intensity of phosphorescence during each cycle due to photobleaching (degradation of emitter molecules) and oxygen consumption (due to increased nonradiative losses owing to matrix change). Yet, even after 40 cycles, the emission rate reached 40 percent of its initial value—sufficiently detectable by eye or camera. Image writing using UV light. By masked UV illumination of the sample, a phosphorescent pattern is printed into the transparent sample. Here, pulsed excitation with a frequency of 1 Hz is used. When taking only one video frame during the off-time of the excitation, the emergence of the phosphorescence is clearly visible. The time delay of each frame to the corresponding switch-off is held constant. The playback speed is accelerated by a factor of 10. Credit: Science Advances, doi: 10.1126/sciadv.aau7310. The values of light intensity and the time required for illumination presented in the study were far below those required by previous techniques, with potential for feasible industrial applications. The study also showed that an imperfect oxygen barrier could lead to the reappearance of oxygen in the activated areas in time. The length of time required for the disappearance of phosphorescence depended on the thickness of the oxygen barrier layer. For example, a spin-coated layer with a 600 nm thickness presented phosphorescence up to five hours, while those with thicker oxygen-barrier films (35 to 40 µm) extended the phenomenon to more than one day. The scientists could increase retention time frames with an improved barrier material or by further increasing the material thickness. To quickly erase a print, the scientists used oxygen refilling through accelerated sample heating with IR or a simple hotplate. As with printing, the time required for phosphorescence deletion depended on the barrier-layer thickness and temperature. Image reading/erasing using UV light. After having finished the writing process, the mask is removed. Subsequent UV illumination of the whole sample only gives rise to phosphorescence at the activated area. Again, pulsed excitation with a frequency of 1 Hz is used. Credit: Science Advances, doi: 10.1126/sciadv.aau7310. The scientists tested a variety of substrate materials as surfaces for phosphorescence illumination. The work included customary photographs with the New York City skyline for large-area application. Since the emission coating was fully invisible when inactive, the materials served as a substrate for programmable on-demand caption projection. Gmelch et al further demonstrated the higher transparency of the coating compared with pure glass (1 mm). In this way, Gmelch et al. realized a fully accessible optical method for writing, reading and erasing on a material for information storage. The work showed the possibility of repeatable noncontact labeling and reading with a resolution beyond the commonly observed printer quality. Gmelch et al. propose the use of highly scalable processes for materials fabrication next. The readout resolution in the work was sufficient to store an information depth of 7 kB cm-2, which is equal to five pages of plain text. The technique opens a new path for information storage beyond permanent data encoding at low-cost and high scaling. The new work will have practical potential in the field of industrial logistics (labeling, tracking and transport).